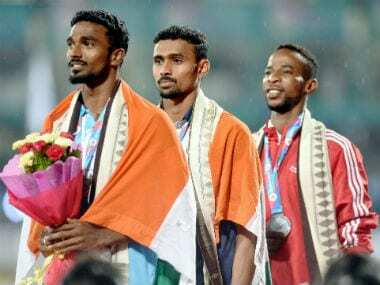 Bhubaneswar: The second day of the Asian Athletics Championships on Friday witnessed some dramatic incidents with the Indian men's 4x100m relay team being disqualified for a rule infringement while a 400m race was rerun because of an inadvertent fault of an official. In a rare incident, Thursday's men's 400m semi-final race, which was won by India's Muhammad Anas, was run again on Friday on the orders of the referee after protest by other countries. In Thursday's race, the recall referee (who indicates a false start) inadvertently pressed his trigger but the race continued as there was no false start by any competing athlete. Anas won the race easily but athletes of some participating countries protested, saying that the recall referee's action had disturbed them and impacted their performance, forcing the referee to order a rerun. In the repeat race on Friday, national record holder Anas had to work harder than last night to finish six-hundredths of a second ahead of Iran's Ali Khadivar. Unlike the first time around when he was in a commanding position heading into the home straight, Anas was behind the leaders on Friday and had to pump himself up in the final 50 metres to win the race in 46.15 seconds. 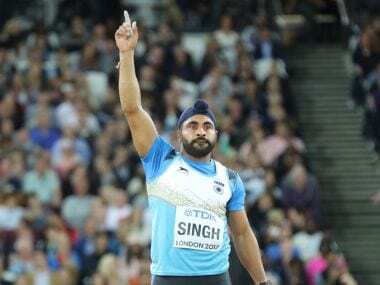 Earlier, the Indian men's 4x100 relay team was disqualified for not completing the final baton exchange inside the permitted zone in the preliminary round heats. The Indian team of John Anoorup, VK Elakkiya Dasan, J Debnath and Amiya Kumar Mallick finished the race ahead of South Korea in a photo finish but was later disqualified to the disappointment of the host country. 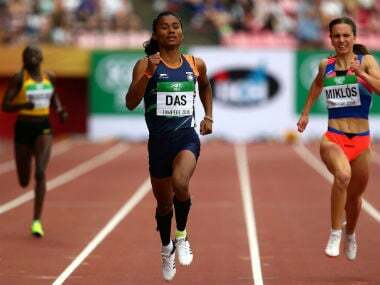 It was a smooth race for the Indians till the first and second legs but the problem occurred during the exchange of baton between Debnath, who ran the third leg and Mallick, who ran the last lap. The exchange took a little bit longer than usual and did not complete inside the permitted zone. The Indians were running in the third lane while the South Koreans were on the fourth in the second heat. The Korean team was later declared winners of the heat with a timing of 40.18 seconds. The other heat was won by China clocking 39.06 seconds. Chinese Taipei qualified for the finals with the second best timing of 39.40 seconds while Thailand had the third best time of 39.48 seconds. The Indians were not the favourites in this event but could have pushed themselves for a bronze in front of home crowd. "During practice, baton exchange has been smooth but today it (baton exchange) was not smooth and there was a mistake," Anoorup said after the race. In the other event of the morning session, Anu Raghavan, Jauna Murmu and M Arpitha qualified for the women's 400m hurdles finals. Juana (57.96 seconds) and Raghavan (58.26 seconds) finished second and third respectively behind Vietnam's Nguyen Thi (57.34 seconds) in the second heat while Arpitha was third in the first heat. The top Japanese in the contest, Sayaka Aoki, who has a season's best of 56.32 seconds, came fourth in a quick heat number one and qualified as one of the fastest losers.